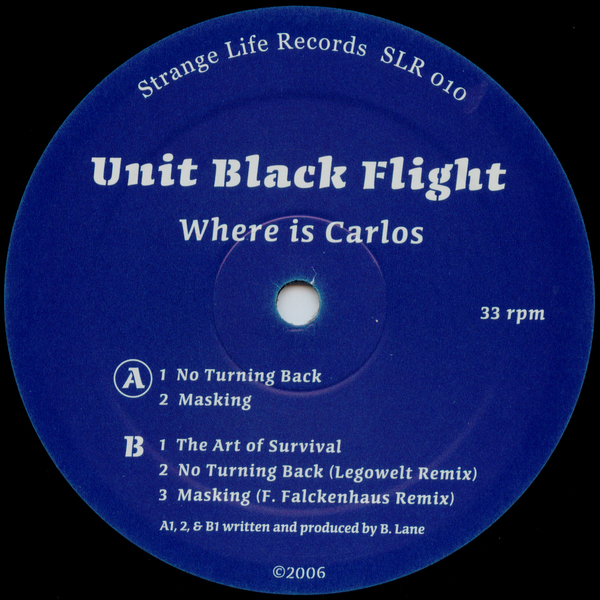 Deeper and darker than the North Sea at midnight, Unit Black Flight's 'Where Is Carlos' is dastardly disco - with the emphasis very much placed on extracting the tar-like essence from the genre's beating heart. If all that sounds a bit moody for your liking, then fear not - for whilst Unit Black Flight is very keen on the less savoury side of the disco, it doesn't mean his work isn't addictively catchy and prone to get you on your plates. With Roland's cascading down and drum tracks smarting at every turn, 'No Turning Back' is a shadowy blister of midnight disco, before 'Masking' pitches in with some borderline soundtrack styles. On the back, 'No Turning Back' is given the once over by Legowelt, wherein Morricone's spirit is evoked for maximum effect. Flight of fancy!